In the early 1970s, while living on the Texas coast, I interviewed a ninety-four-year-old woman about her German ancestors who had come into Texas through the thriving seaport of Indianola. Her family did not travel inland as so many other Germans had done. Instead, they stayed and helped build the farming and cattle region along the central Texas coast. Her stories kept stirring my imagination over the years as I delved deeper into the history of Indianola, which had become a ghost town as the result of that storm. On Sunday afternoons, when we joined other families at the Indianola Beach to water ski and sail, I was captured by the desolate, flat shoreline where a lone shellcrete cistern weathered among the weeds, and the foundation of the old courthouse peeked above the waves just beyond the shore. When I wrote Legacy, a coming-of-age novel set in a small Texas town during the last year of World War II, some of the imagery I captured from that long-ago interview became the words that Miranda, the young girl in Legacy, loved to hear about her grandpappy’s experiences on the Chisholm Trail: “So many cattle being driven north that one trail almost ran into the next. At night, when the cowboys settled down, they could see off ahead and way behind, little firefly flickers of other campfires dotting the countryside. “Indians lined the way. Never bothered them except to slip away with a loose cow or one of the extra horses. Sometimes they rode past swarms of Indians standing along the trail like they were watching to see if the men might look away, give them a chance to pick up a meal for their whole outfit. She also told me that when she was a young woman, back before there was a causeway, she sailed her sloop across the bay to teach school all week. If the weather was good on Friday afternoons, she sailed back for the weekend at her parent’s home. Mrs. Watkins, one of the characters in Legacy, shared that story about her own girlhood. But the one story I heard in that interview that haunted me all these years was something she mentioned only in passing: A German woman and her children arrived in Indianola after watching her husband and their papa, who was drunk, leap back and forth from the ship to the dock. As the ship pulled away, he fell to his death in the river. That story filled my imagination and finally developed into Stein House, my latest historical novel, a family saga set in Indianola between 1853 and 1886. Helga Heinrich became that German widow who operates Dr. Stein’s boarding house overlooking the road to Texas’ interior and the fickle waves of Matagorda Bay. The colorful characters that live in the Stein House are entwined with the turmoil of the Civil War, the threats of yellow fever and the horror of the infamous 1886 hurricane. Stein House is a tale about Texas history that evolved from an afternoon interview almost forty years ago. It is in production, and I will let you know when it’s published. In the next few weeks, I’ll be sharing some of the amazing history that took place on the Central Texas Coast. 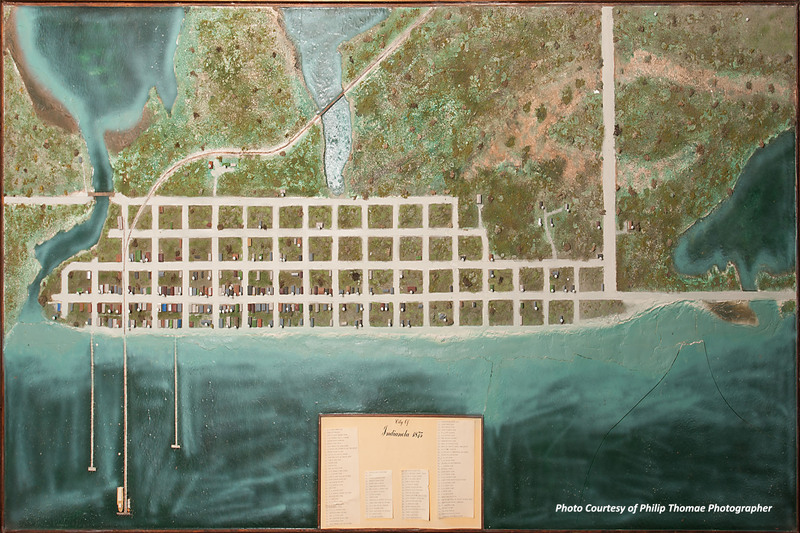 Diorama of Indianola in 1875, created by Jeff Underwood, photograph by Philip Thomae from the Collection of the Calhoun County Museum, Port Lavaca, Texas. Totally interesting. Love the cistern bit. Glad you liked it. Thanks for writing. Oh Myra, this sounds great. Can’t wait. I love the imagery of so many campfires along the cattle drives. Thank you so much for your support. I’m really looking forward to sharing Stein House with you. Can’t wait to read Stein House. Such interesting background stories! Thanks so much. I hope enjoy it. Sounds like a book I would enjoy Myra. I continue to admire the wealth of your knowledge! You are quite an amazing woman.